A KC-135 Stratotanker from the 186th Air Refueling Wing , Mississippi Air National Guard, prepares to deliver fuel to a Hawaii Air National Guard C-17 Globemaster III January 17, 2019, near Gulfport, Mississippi. 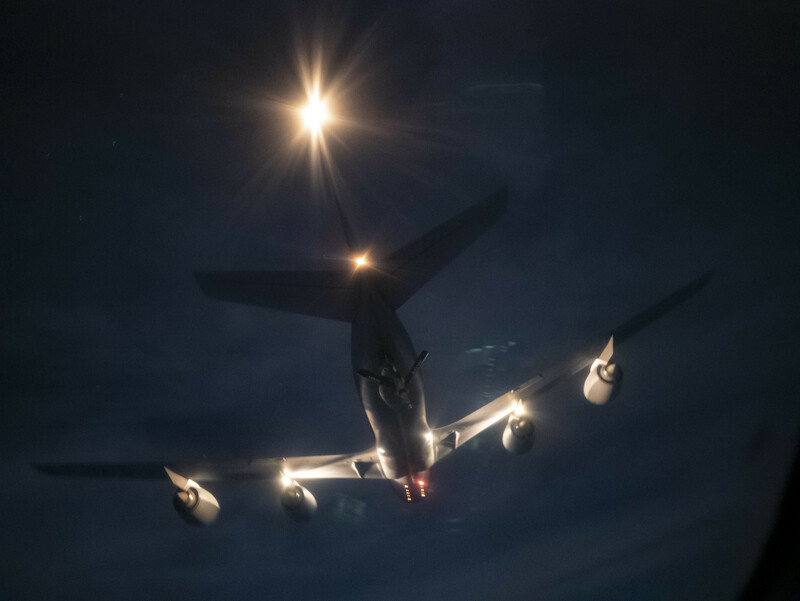 The 204th Airlift Squadron conducted the night time aerial refueling mission during exercise Southern Strike. The annual training is a is a total force, multi-service exercise hosted by the Mississippi Air National Guard’s Combat Readiness Training Center in Gulfport, and Camp Shelby Joint Forces Training Center near Hattiesburg, Mississippi. from January 15 through 30. The exercise emphasizes air-to-air, air-to-ground and special operations forces training opportunities. This is a unique photograph because most air-to-air refueling shots are taken from the tanker.